She was born and lived in Rome in the third century under Emperor Decius. After settling in a monastery as a nun she was arrested, courageously confessed her faith, and after terrible tortures she completed her life in a martyric way. While she was alive she was a benefactor to people with her holy life and her prayer was pleasing to God. After her death she became even more of a benefactor and consoler. She has a living presence to those who piously run to her intercessions. Her sacred Relics, which exude the fragrance of the Holy Spirit, are a source of healing and treatment of various diseases, both of the soul and body. When I, as a young student, first visited the Holy Mountain with my friends and in particular Gregoriou Monastery, the fathers offered to us the sacred Relics of the Monastery, that we may venerate them and receive their blessing. These are the fragrant flowers of the Garden of the Panagia and one of the most valuable gifts the Athonite fathers offer to pilgrims. 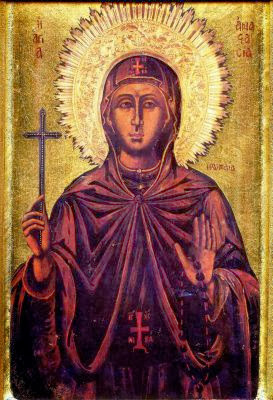 Among the other sacred Relics, I also remember that of the Venerable Martyr Anastasia the Roman, who is among the triad of patron saints of the Monastery (together with Saint Nicholas the Bishop Myra in Lycea and the Venerable Gregory the founder of the Monastery). Besides the fragrance of her sacred Relic there remained etched in my memory the stories of the fathers about her miraculous (which for them were done at critical times) interventions, and especially how the Saint is for them a "refuge in afflictions", a firm protector and consolation. When she was arrested and martyred she was young in age, but she was well beyond her age in wisdom and a valiant spirit. She did not bend before cruel tortures, and after the cutting off of her breasts they tore her flesh with fire-heated iron. She remained rigid until it came to the point that they cut off her head. The Venerable Martyr, like all the saints, had pure thoughts. Through asceticism and the observance of the commandments of the Gospel she was purified and through the optical part of the soul, the nous, she was able to discern the uncreated energies of the Grace of God from created demonic energies. She learned not to hold on to and entertain impure thoughts (logoismoi), but turned them away before they entered her nous, and from there they would have entered the heart and turned to action. Logoismoi are thoughts combined with images, which with the help of imagination and the passions captivate the nous. Care is needed that they do not enter the nous, but that they remain in the reasonable part of the soul. First one holds on to the good logoismoi and removes the evil ones by turning them into good ones. But then it is desirable to not entertain even good logoismoi, because they may not be completely free from passionate concepts. Victory against the devil and sin or on the contrary our defeat and enslavement, begin with logoismoi. Whoever emerges victorious in the area of the logoismoi, can progress to higher levels of the spiritual life. This is why the Holy Fathers call the fight against logoismoi the art of arts and science of sciences. Saint Anastasia did not deny Christ or sacrifice to idols, but she conquered and wiped out the tyrants by remaining constant in her faith as a steadfast pillar, because she did not lose the fight against the logoismoi. The struggle with logoismoi is among the most important chapters in the spiritual life. This influences not only our spiritual progress and salvation, but also our way of life and daily behavior, because virtue, as well as evil, have social implications. Anyone tormented by logoismoi and is unable to find peace by himself, negatively affects the community around them, since it is not possible to find it also with others. Whatever happens daily around us we must accept with good and simple logoismoi, without delving into complex processes, of the type that ask how and why and perhaps this and perhaps that, which complicate matters worse and create problems out of nothing. The simplicity of which the Apostle Paul speaks is not unconnected with the logoismoi and are a true wealth, "enriched unto all simplicity". Victory in the field of logoismoi valorizes man on the social level, and primarily leads him to a living communion with God. Source: Ekklesiastiki Paremvasi, "ΟΣΙΟΜΑΡΤΥΣ ΑΝΑΣΤΑΣΙΑ Η ΡΩΜΑΙΑ", October 2000. Translated by John Sanidopoulos.